Holiness is for You looks at why many Christians do not experience personal holiness in their daily walk with God and why many Christians feel constantly defeated in their struggle with sin. Jerry Bridges shares an incident of how one phone call shattered his pursuit of holiness. A phone call that left him seething inside with anger, resentment and perhaps even hatred. He had just finished his Quiet Time with God contemplating the promises of victory over sin. His desire was to live an obedient and holy life, and yet there he was utterly defeated by one phone call. Jerry had to ask himself that morning, "Does the Bible really have any answers for real life?" With all your heart, you desire to live an obedient and holy life, and yet a conflict at home, an uncontrollable temper at work, an immoral habit or a besetting sin can shatter your pursuit of holiness and you can feel utterly defeated. In fact, God commands it. Most people these days see the concept of holiness as somewhat archaic. It tends to conjure up images of yesteryear. For others there's the idea of those holier than thou people who attack and criticize anything modern. However, holiness is a biblical concept. In fact, the idea of holiness is woven throughout the fabric of Scripture. There are several false concepts of holiness. Jerry Bridges names three in particular. There is the concept that holiness is a list of do's and don'ts usually in such areas as smoking, swearing, drinking, etc. etc. This concept of holiness fosters self-righteousness and a judgmental spirit. Others see holiness as a particular style of dress or mannerisms. Still others see holiness as unattainable perfection. This concept can lead to delusion and discouragement. While these concepts have some truth; nevertheless, they miss the true understanding of biblical holiness. So what is biblical holiness? As Jerry Bridges himself puts it, "To be holy is to be morally blameless. It is to be separated from and, therefore, consecrated to God. The word signifies separation to God, and the conduct befitting those so separated." When the New Testament refers to holiness, it does so in contrast to something. For example, Paul used the term holiness in contrast to immorality and impurity. Peter used the term holiness in contrast to the evil acts we did when we were without Christ. John used the term holiness in contrast to those who do wrong and are vile. So, to live a life of holiness implies a life that conforms to the moral instructions in the Bible as opposed to the sinful ways of the world. Now that we know the concept of holiness and the necessity of holiness for the Christian life, why does holiness allude us? Why is it that many Christians feel defeated when it comes to their struggles with sin? Why is it that churches seem more like the world than God? Jerry Bridges suggest three basic problem areas. Bridges makes a very interesting point here. He states that our focus is often on victory over sin. We are so focused on the victory that we fail to see that victory is a byproduct of obedience. Bridges writes, "God wants us to walk in obedience - not victory. Obedience is oriented toward God; victory is oriented toward self...as we concentrate on living an obedient, holy life, we will certainly experience the joy of victory over sin." Bridges points out that this misunderstanding involves the thought that no effort at holiness is required on our part. That is, any personal exertion on our part is not required. Of course, this is not correct. As Bridges writes, "We must face the fact that we have a personal responsibility for our walk of holiness." In other words, we can put away any habit that besets us if we truly desire to do so. Of course, God plays a part in this process too as we do also. As Bridges writes, "We have mentally categorized sins into that which is unacceptable and that which may be tolerated a bit...it is compromise on the little issues that leads to greater downfalls." Bridges further notes, "Are we willing to call sin 'sin' not because it is big or little, but because God's law forbids it? We cannot categorize sin if we are to live a life of holiness. God will not let us get away with that kind of attitude." Bridges concludes this chapter by saying, "Will you begin to look at sin as an offense against a holy God, instead of as a personal defeat only? Will you begin to take personal responsibility for your sin, realizing that as you do, you must depend on the grace of God? And will you decide to obey God in all areas of life, however insignificant the issue may be?" You can purchase The Pursuit of Holiness by Jerry Bridges by clicking on the following link The Pursuit of Holiness and you can download the study guide by clicking on The Pursuit of Holiness Study Guide. 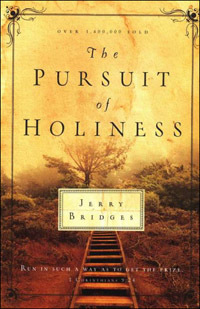 The Pursuit of Holiness: The Pursuit of Holiness by Jerry Bridges is an inspiring book that looks at holiness which is a tremendous challenge and an awesome reminder of God's desire for His children to walk in light of His word.